Employers have changed how they view health care plans. With all the reforms and high costs, companies struggle to cope with the ever-changing landscape. Employers create benefit plans with employee retention and cost control on their minds. However, many forget about a little helper called voluntary benefits. Nearly every employer looks to achieve these goals with health care. Offer great benefits to employees without breaking the bank. Many companies achieve this noble goal by using a self funding approach that features a high-deductible. Often, these companies are larger. Recently, smaller companies have taken this approach, too. When paired with voluntary benefits, employers reduce costs greatly while still giving their employees the type of insurance they need. Plus, employees can tailor their coverage with a variety of options. So why have employers started going the self-funded route? That's simple. Health care costs are rising. By using self-funded services, a company can keep medical expenses down. 1. Control Costs: Self-funding allows employers to control costs, with funding amounts that are pre-determined. This ensures the profit margin of the insurance company is cut down. 2. Protect the Plan: Using stop-loss insurance as an employer can ensure no catastrophic claims exceed the pre-determined amount in their self-funded plan. 3. Only Pay Actual Claims: Instead of paying the margin created by an underwriter, a self-funded plan allows the company only to pay medical claims that actually happen. 4. Keep Track: A self-funded plan ensures an employer can keep track of the plan and accounts. By keeping statistics year after year, an employer can plan for the future management of their self-funded program. 5. Further Savings: Certain self-funded plans save even more money by utilizing a predictive analysis to determine health and wellness. A third-party administrator usually administers this. Lastly, many companies prefer self-funded plans because they may not be subjected to Obamacare regulations. Since they do not have to follow all the regulations of the Affordable Care Act, the company can tailor plans to the needs of specific employees and groups. Once an employer has a self-funded benefits plan, they can begin to allow voluntary benefits. Voluntary benefits complement the plan and allow employees to meet their every need – without adding unnecessary costs to the plan. By combining these two options, employers allow their employee the ability to customize the benefits to their unique needs. The benefits of this methodology are vast and allow companies and employees to account for expenses in a detailed manner. No matter how a company offers health insurance, communication is key. The majority of employees are tired of spending so much money on health care. As well, most have concerns about how the changing health insurance market and reform will impact their families and pocketbooks. Studies have shown that 95% of employees need an individual to talk to them about benefits information. This means your employees need to speak with an administrator. They want to keep communication lines open when they have questions and want access to resources. Communication is especially needed when a company offers a self-funded plan with voluntary benefits. The variety of options and costs can be confusing – so being able to communicate with an administrator is key. Employees want great benefits and lower costs. Most companies want similar things in regards to health insurance. As such, many have found self-funded plans combined with a myriad of voluntary benefits options to be a dynamic insurance duo. For more information about self-funding contact Skyline Risk Management, Inc. at (718) 267-6600. It took President Obama several years to create and complete Obamacare. The system is vast and complex. Plus, it took years just to approve the legislation before any implementation could be completed. Repealing the system is not going to happen overnight. Millions of people utilize Obamacare. And many Republicans agree that instantly repealing the system could cause a shock to the industry – and not in a good way. No matter what happens, most predict change is inevitable. Trump could sign a repeal of Obamacare in his first days in office. Then ensure it doesn't go into effect for some time. This would allow Republicans to draft complex plans and policy for the replacement of the Affordable Care Act. Everyone in Congress is confident that repealing the act will be much easier than replacing it. For example, certain provisions will be included in the new health care laws and mandates. Many Republicans, including Trump, like the age provisions that allows young adults to stay on their parent's insurance plan. Other Republicans are found of provisions that offer guaranteed coverage to all. Health insurance companies are essentially playing a waiting game at this point. The Affordable Care Act was a complete and utter shock to the industry. Many insurers struggled to cope with the various regulations and costs. However, now that the act is in place, things seem to be running smoothly. Repealing and replacing Obamacare will be anything but smooth. Many health insurance companies are crossing their fingers in hopes of a minor disruption. Most people in the industry don't want to see the shock and chaos that implementing Obamacare brought just a few years back – again! Obamacare, repealing, and new replacement legislation is going to get tricky. For instance, most believe that guaranteeing coverage for pre-existing conditions is an important piece of legislation. However, many argue that the mandate requiring all Americans to have health coverage is unjust. Many Republicans, like Speaker of the House Paul Ryan, have proposed similar legislation to Obamacare. He'd like certain people to receive tax incentives to help people afford the type of coverage they need. He's also interested in protecting people from rising rates for illness – when they maintain continuous health insurance coverage. While Obamacare has taken certain hits here and there, the people of the United States have hit a record low of uninsured. More people have coverage in the United States than nearly ever before. In this way, the Affordable Care Act was a success. Not every aspect of Obamacare has been successful, though. Major insurance companies like Aetna and UnitedHealth Group both withdrew from the program. Premiums have skyrocketed, too. Plus, many Obamacare plans feature high deductible – ensuring many couldn't afford care if they got ill.
Once the bill is repealed, Republicans and Democrats will have to work together to replace the parts of Obamacare that everyone agrees on. It will take time, a lot of time – as that's just how things work in Washington. Hopefully, the time and change won't have too negative of an effect on the health insurance industry and the American public. For more information about health insurance contact Skyline Risk Management, Inc. - (718) 267-600. The holidays are here. Thanksgiving, Christmas, New Years and more are some of the best times of the year. They are also some of the most dangerous from an insurance and risk perspective. See, millions of Americans host family and friends for days and night of joyous celebration during these times. These parties and events often require days upon days of planning, coordination, and more. Due to the nature of holiday parties, many risks rear their ugly heads during this beautiful time of the year. Many hosts chose to hire vendors to help with the parties and mitigate these risks. This can open a whole other can of worms when your personal liability exposure is taken into account. Hosting a large holiday party will require hiring vendors and coordinating the event. However, every single vendor you hire will bring on added risks. To mitigate these risks, you'll need to focus on one fundamental issue. You must make sure every single vendor you work with is bonded, licensed, and insured. While you won't be able to talk about a vendor's insurance coverage with a reference, you may get a glimpse into how the vendor responds to a crisis – especially important around the holidays. Once you found a great vendor to work with, you'll need a signed contract that clearly states the services and functions your selected vendor will provide at the party. Make sure the contract clearly details dates of services and exact times. Also, it's vital that a contract has a hold harmless clause include. The provision ensures that hosts are not held responsible for damages related to a vendor-related injury or accident. Holiday parties and booze go hand in hand. “Many a great story” only happened because a holiday party got out of control after the booze started to flow. Still, you need to take a few precautions if you're serving alcohol at your holiday party. First and foremost – you should only hire a bartending or catering service that insures its staff against any and all booze-related liabilities. This is of the utmost importance. Next, you need to understand personal liability. It's imperative that you let the bartenders do what they do best – serve drinks. Do not get involved with the pouring of drinks. Bartenders need to card anyone they suspect to be under a certain age during the event. This is the law and will ensure you're not held liable for any underage drinking issues. Parking can play a huge role in your holiday party, especially as an event gets larger and larger. Hiring parking attendants or a professional valet service can ensure smooth sailing on the roads during your event. You'll avoid blocking roads, minimize collisions, and ensure the safety of your guests. As always, you'll need to work with a properly licensed valet company and get a contract in place. Once this is done, you can begin working on a parking plan with the company. Finally, you need to pay attention to the weather during your event. With snow, sleet, and ice common in the winter months, you'll need to have a plan in place that gets guests from parking to the party in safety. To do so - you'll need to prevent slips and falls. Start by removing all ice and snow from any walkway or staircase. Make sure you have salt or sand on hand during the event. Next, add some additional lighting on walkways to ensure black ice won't sneak up on anyone. Then you'll want to post signage warning guests to pay attention and watch their steps. There are roughly 76 million baby boomers in the United States with an approximate average age of 60 years old. It is no secret, as people age, they may require assistance for activities of daily living. Understanding this concept and considering the large population of aging baby boomers, insurance carriers have created a product to help reduce the costs of long-term care. This product is called long-term care insurance (LTCI) and this article well help educate anyone who is considering purchasing this product. What is Long-term Care Insurance (LTCI)? Long-term Care Insurance (LTCI) is an insurance product, which helps to cover the expenses associated with long-term care beyond a predetermined period of time. People who require long-term care are those who have an inability to preform two or more basic activities of daily living. 1. Mobility - ability to "transfer" your body. For example, a persons ability to walk or get out of bed. 5. Personal hygiene - the ability to brush your teeth, comb your hair, and other grooming practices. 6. Bathroom - the ability to use the bathroom independently. This includes being able to get to the toilet and your ability to get up off the toilet. If a person is unable to complete two or more of these activities of daily living (ADL) then they are eligible and would certainly benefit from long-term care. Who does Long-term care insurance (LTCI) benefit? Long-term care insurance has many benefits for various people. A common misconception is that long-term care insurance is a benefit only for the person in which the policy is meant to insure. Actually, the family members of the insured are the ones who benefit the most. In many cases, long-term care is expensive so when a loved one is no longer able to perform two or more actives of daily living the responsibility of caring for this person often falls to family members. Depending on their financial situation, some families cannot assume this responsibility and cannot afford to hire professional help. By purchasing LTCI a person is not only protecting themselves but also the financial well-being of their loved ones. What does Long-term care insurance (LTCI) cover? Home Care - this allows a person who requires help with ADL to receive aid right in their own home. Adult Daycare - this is a non-residential facility, which caters to adults who require help with ADL. Hospice care - this services provides care to support people with advanced or terminal illnesses. Nursing homes - private institutions, which provide aid for elderly people and/or people who require help with ADL. Assisted Living - provides housing for elderly people and/or people who require help with ADL. Respite Care - temporary care for a person who requires aid with ADL. Does my health insurance and/or medicare cover long-term care insurance? No, traditional health insurance and medicare does not cover you for long-term care. Although under certain financial circumstances medicare may cover a portion of long-term care, an individual will still have to cover the costs of the majority of long-term care expenses themselves. There is a price associated with everything. The important thing to remember is that if you require long-term care this could really become a financial burden to yourself and your loved ones. Be prepare, be protected and please do not underestimate the impact of long-term care insurance. For more information contact Skyline Risk Management, Inc. at (718) 267-6600. Drones have quickly become a huge industry. Nowadays, you will find drones flying over your head often. These unmanned aircraft systems are piloted from the ground using a control station and offer simple solutions for many a dangerous task. The drone industry is booming, and most predict it will be a multibillion-dollar sector within years. Industries like industrial inspection, border patrol, photography, fire fighting, and more have all adopted the technology with great success. Even insurance companies have gotten in on the drone craze. Using drones to survey damage after a disaster has become common practice for insurers. As such, insurance companies know exactly how much risk can be associated with using a drone. Drones can be used for evil, too. There have been reports of drones being used to target infrastructure, and many have concerns about a drone attacking a large crowd at a stadium or concert. No new technology is perfect. It is common to lose control of a drone. This happens if the device flies out of range, if the frequency is interrupted, or a system failure occurs. There have already been numerous reports of such incidents, including major injuries. Spoofing occurs when someone attempts to take control of a drone by hacking the signal and commanding the aircraft from a different control station. This is a huge risk. Cyber attacks can result in a drone being stolen out of mid-air. Using a drone still has a bit of the wild, wild west feel. There are very few regulations regarding drone use throughout the world. This could become a real problem, especially when sharing airspace with military operations. Many are concerned with the ability of drones to spy and invade privacy. Drones can be used to invade privacy, trespass, and more. Soon, the Federal Aviation Administration will provide drone owners with a set of guidelines dedicated to privacy. Many drone owners are novice hobbyists looking to have fun and mess around with new technology. These pilots are rarely skilled and can provide a large risk to public safety when playing with their unmanned aircraft. Any industry that is predicted to see such growth as drones are will have some risks. Drone use is expected to triple by 2020. This will lead to a lot more bad pilots out there and more problems. Ultimately, insuring drones will be a difficult endeavor. Many hobbyists will not want to insure their drones. Many businesses will require full coverage. An underwriter will have to look at the aviation risks of an unmanned aircraft in a different manner to manned aviation. In the case of MCM Products USA, Inc. v. Aliusta Design, the court addressed the issue of whether a subcontractor could make an unjust enrichment claim against a property owner when the contract is between the general contractor (GC) and the subcontractors. This case occurred due to the GC’s insolvency and the resulting situation in which subcontractors were not paid for work that they did on the project. This led them to try to get paid through the owners of the property instead, who had paid the GC rather than the subcontractors. It all started when MCM leased a space for their luggage and accessories store in Manhattan. They hired a general contractor and signed a $1.4 million contract to renovate the leased property in June 2014. This GC hired subcontractors to do the construction, but there was not a contractual relationship between MCM and any of the subcontractors that actually did the majority of the work. On March 2015, the GC filed a mechanic’s lien against the property and some subcontractors did as well. The lease that MCM had signed with the landlord required that MCM discharge any mechanic’s liens against the property promptly. MCM filed a lawsuit in May 2015 seeking a judgment, declaring that they did not owe the subcontractors any money. Counterclaims for unjust enrichment were filed against MCM by several subcontractors, saying that the leased property unjustly benefitted from the work done for which payment was not made, and that MCM should be responsible for payment. MCM moved for dismissal of the counterclaims. When the court came to a decision, they dismissed the unjust enrichment counterclaims made by the subcontractors. The court followed previous case law to hold that a claim of unjust enrichment is not able to be supported simply because a company benefited from the work done by the subcontractor. If there is an express contract between a GC and subcontractor, the law is very clear that the owner is not liable, unless the owner has agreed to pay the subcontractor themselves. The consent of the owner to allow the subcontractor to work on the property is not enough. The owner has to take action that would show clear indication that they were going to pay the subcontractor themselves, rather than the GC doing so. The court did not address the validity of the mechanic’s liens in this decision at all. To reach their decision, the court used existing New York law to bar the unjust enrichment case, simply because there was no evidence that the owner (MCM) had indicated any intention to pay the subcontractors. In some cases, however, a subcontractor could have a valid unjust enrichment claim if they can show that an owner had direct dealings with the subcontractor, even if there was not a contractual relationship. Included in this are situations in which the owner pays the subcontractor director or indicates that they will pay the subcontractor. This backed up existing law in New York. If you have ever purchased a home or vehicle, you may have been asked to obtain a certificate of insurance. A Certificate of Insurance, or COI, is a document that shows that your insurance policy covers the vehicle or the property in question, without having to produce a copy of the entire policy contract. It lists essential policy details, such as the vehicle/property insured, the coverages, and any third party interests that the insurance policy names. A Certificate of Insurance differs from an ID card in that an ID card is typically used only for vehicle policies and is far less detailed than a COI. Certificates of Insurance are also different from a copy of your policy in that the policy is much more thorough than a COI. Certificates of Insurance are typically a more convenient size than your insurance policy, the size of a single page or smaller, and can be more easily produced. Certificates of Insurance are a happy medium between the ID cards and a copy of the policy in regard to the amount of information provided, but another significant difference is that most of the time they do not come directly from your insurance carrier. Insurance agents are authorized to issue COIs on behalf of the insurance carrier manually, and are often required to do so. Most often, a third party who wants to ensure that you have the coverage that you say you do will request a Certificate of Insurance. If you have a lienholder or additional insured on the policy, the document will list their names as well as yours. For those third parties with an interest in your property or vehicle, it is a way for them to quickly verify that your policy aligns with their requirements. A Certificate of Insurance may seem like a better alternative than relying on the numerous pages of your insurance policy to show your coverage. However, there is a caveat to its convenience. A Certificate of Insurance is meant to be informational only. It is not a legally binding document and does not guarantee what an insurance policy will or will not cover. Another downside to Certificates of Insurance is that individuals can easily fabricate them. Human error also plays a factor since the COIs are often manually created by an agent. While a Certificate of Insurance is a fantastic tool when it comes to providing proof of your coverage, you should never rely on them as the sole method by which you review the specifics of your insurance policy. Instead, if you want to ensure that your coverage matches your needs, review your insurance policy first. If you have a good understanding of insurance, you should be able to find the information you are looking for just by reading your copy of the policy. If you can't locate the answer you're looking for, or don't understand the answer that you find, contact your Agent. They are licensed in insurance for that very reason and can clarify any questions you have about your policy. Don't let a lack of understanding keep you from the coverage that you need. Not sure if you have a COI? Don't know how where your COI is? Call Skyline Risk Management, Inc. at (718) 267-6600 for help obtaining your COI. Sadly, we see it all the time. There are active shooter situations happening more and more frequently these days. Social media shows us new ones nearly every week. While this is sad for society, you have a business to run. So you have a responsibility to stay prepared and protect your hard work. Enter active shooter insurance. As a business owner, your clients’ depend on you to provide them with a safe environment and to keep them protected from risks they could face at your business at any given moment. This means preparing your customers for active shooter situations. The easiest way to do just that is by educating customers on the perils of these scenarios outside of the obvious – tragedy. Businesses need to realize that the fallout from these chaotic events can cost companies a lot of money. Over the past 10 years, we've seen the three most deadly shootings in United States history. These shootings were all active shooter situations. Scenarios where someone enters a confined or populated area with the intent to kill people, usually with the use of a firearm. Typically, these attacks occurred at work or school. They stems from the fact that these shooters often relate their pain and anger to these places combined with the fact that many people can be found at these places, and a lot of damage can be inflicted quickly. The United States has become a hotbed of active shooter situations. Over the last four decades, the U.S. has seen nearly 31% of mass public shootings throughout the world, but we only have 5% of the world's population. While getting an active shooter insurance policy can protect a business financially, most companies also feel a certain amount of responsibility for keeping their employees, students and customers safe while at these places. In legal terms, this is referred to as "duty of care" by most. In addition, a business owner could be held liable if certain precautions are not in place before a situation like what was stated above were to occur. Insurance companies should work with business owners and organizations to stress the importance of implementing training regarding these types of situations. Another major key is to make sure emergency exits are easily accessed during open hours. If you have a high traffic company, then hiring a well-trained security staff could be crucial in keeping your organization safe at all times. While this will cost resources, you'll find an increased customer safety and trust does benefit the bottom line. Active shooter policies are not an end all, be all. Nothing can eliminate the risk of an active shooter attacking a school or business. And nothing can prepare us for the potential that could result from such actions. Still, businesses can mitigate these risks as much as possible by following the tips found here. Get an active shooter insurance policy. Train your staff, students, etc. to be prepared for the potential of an attack. Then focus on allocating any available resources to hiring a well-trained security staff. Having an experience with an active shooter can be traumatizing to say the least. The effects of such an experience can stay with a person throughout their lifetime. Limit your risk and protect yourself. For more information about active shooter insurance, contact Skyline Risk Management, Inc. at (718) 267-6600 to voice your concerns. You may have to worry about tornados in the Midwest. If you live in Louisiana, then floods are always on your mind. Earthquakes are no strangers to Californians. Florida sees its fair share of hurricanes. No matter where you run your business from, there's a chance disaster could strike. If a disaster does occur and you're face-to-face with a catastrophic event, you need to be prepared. You need to have a plan in place. You need to be able to get your business back up and going as quickly as possible. 1. What needs to happen? After a catastrophic event, there will be certain parts of your business that need to be up and running as soon as possible. Other areas of your business aren't as important. Decide what must happen immediately after a disaster and come up with a plan to get essential activities going again quickly. 2. Can you continue to provide value? If a catastrophe were to strike tomorrow, would your company be able to continue to provide value and service to your customers? If not, you need to look into how you operate and find ways to continue to be there for your customers no matter what. 3. Whose help would you need to get back on your feet? Many times, companies need help from insurance agencies, contractors, and more to get them back to work. Think about which individuals you would need help from to restart operations. 4. How can you help your customers? Even if you could not provide the full scope of services and value to your clients right away, you need to think of ways you could continue offering some of your services. A little effort goes a long way, especially when dealing with a disaster and your loyal customers. 5. Do you know your community? You should be aware of all of your local emergency resources and be able to communicate with them immediately if a catastrophe were to occur. Don't forget about your local connections! 6. Do you have other protections in place? Have you fully insured your company in every possible way? Did you pay extra for some preventative measures when building your organization? Focus on finding and cultivating ways to protect your business if something terrible were to happen. 7. Did you protect your vital documents? Did you guard your legal documents—files, tax returns, and such—properly? This is absolutely vital before a disaster strikes. You need to back up everything. 8. Would you still have access to your vital records? Did you backup everything? You want to make sure all of your documents are readily available as you try to recover your business after a storm. 9. Did you do it all? After going through these tips, take a second to step back and consider if you did everything you could. Often, business owners will take numerous preventative measures, but forget to cover some of the basics. With a little introspection, you should be able to avoid any such fate. You cannot predict when that storm will hit, but you can always be prepared for it. With a little foresight, you'll have your company back up and churning in dollars before you know it. Use these tips and questions to ensure you're always ready. Concerned about how your business or home would hold up against a storm? Contact Skyline Risk Management, Inc. (718) 267-6600 to voice your concerns. Businesses on the fence about product liability insurance need only to search the internet for information about product claims and recalls for clear evidence that this is a "must have" for protection from the various regulatory commissions that will seek remedies for consumers. 2. Oversight: Since governmental oversight of products and their distribution has increased standards that manufacturers must comply with, increased civil and criminal penalties are a risk that businesses must mitigate. The FDA not only regulates products in the marketplace, but now they have the power to regulate how food is grown, harvested, and even processed. 3. 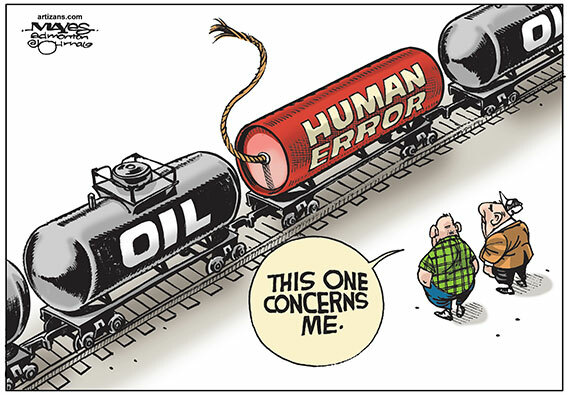 Human Error: As long as humans are involved in production, it is impossible to guarantee that errors won't happen. Even with the most stringent safety protocols, errors happen that can result in a consumer injury or even death. When it comes to food products, the damage is not always limited to a particular product. For example, if a particular brand of food is recalled, over-zealous retailers may pull the entire brand from the shelf resulting in a massive financial hit to the manufacturer and distributor who must credit the retailer for the returned product. The act of regaining lost shelf space in a large retailer may be impossible without available resources. In this circumstance, a product liability policy will be invaluable for the business to be able to come out on the other side of a recall. 5. Low Cost of Mitigation: With any foreseeable risk, typically the most affordable method of mitigation is to transfer the risk to an insurance carrier. Even with the amount of settlements that have been paid historically, product liability insurance and product recall coverage remain an affordable means of financial protection. Knowing that just one action could result in financial devastation, it is incumbent upon business owners to transfer this risk to an insurer. If your business provides any product to consumers, your company needs product liability coverage. In some cases, this coverage may be available as part of the General Liability or Business Owners' policy, but is important for you to confirm this with your insurance professional and not make any assumptions. The premium for this coverage will typically be based on the type of product, the sales volume, and the part your company plays in providing the product to consumers. For more information and details about Product Liability and Product Recall Coverage, contact an insurance professional at Skyline Risk Management, (718) 267-6600 for free and confidential consultation.